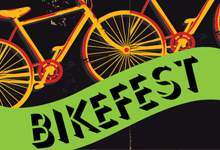 You’re invited to the City of St. John’s first ever BikeFest, a free cycling event for all ages and abilities, in partnership with Happy City St. John’s. This free, family friendly event features guided bike rides, face painting, bike decorating, an obstacle course, buskers, and musical entertainment in the afternoon. Over $500 in prizes will be up for grabs! Detailed Event Map available here. Accessible parking will be available on George Street at the corner of Adelaide Street (see map), and also on Harbour Drive. The City Hall Parking Garage (Level 1, 3 & 4) is open to the public and free to use on Sunday. There is a private parking garage available at 351 Water Street, and on street parking at metered spaces throughout the downtown area.